Cloud Climbing Beauty: Best Start Up Incentive Ever! My father-in-law passed away Sunday morning after struggling with Pulmonary Fibrosis for the past year, so I was out of town for a couple of days and have not been as active with my blog as usual. I'm playing catch up in other areas (like grading Bible Correspondence Courses and working on taxes and Avon deliveries to local customers) today so I only have time for a quick post. 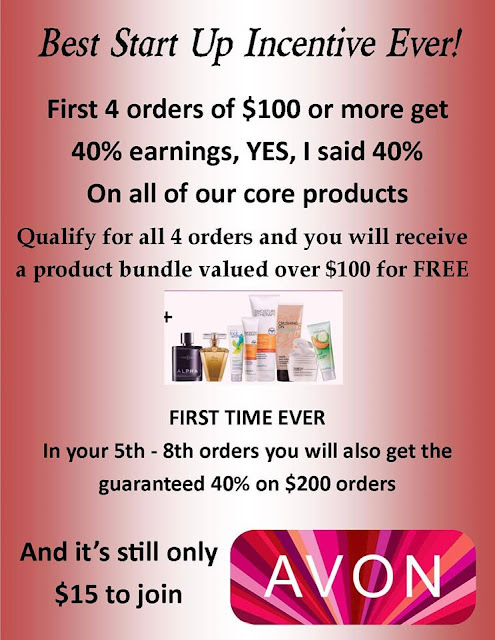 I came across this image just now which gives the information about Avon's current offer for those starting their Avon business. Take a look and see what you think, and if you are ready to get started with your new business just click on the pic and join my great team of Avon Cloud Climbers.